Hiya Planeswalkers! Kya here, enjoying the New Year so far and hoping everyone else is too! This last pre-release of Rivals of Ixalan was a great way to start out another year of slinging cardboard! I hope those who participated in the pre-release had great pulls as well! Today we’re going to continue with our Bringing Magic to Life series and provide some great 3d miniatures for your magic games. Speaking of the New Year, I wanted to start off strong and provide a very nasty deck list of mine. The one and only Jhoira of the Ghitu! For maybe the 3 followers that have been viewing my articles since I started, we know I like to play silly decks and have fun. But what happens when little Kya gets angry and wants to watch the world burn? Well she builds decks that cause world wide destruction and pull the multiverses worst creatures to spawn from the ashes. We all have our party pooper decks, and the queen of time is a beautiful representation of my fury! So who is Jhoira of the Ghitu? Now for many, she’s not a new card by any means. Many know the terror she brings. 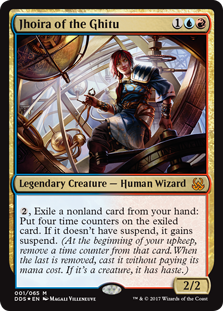 Looking at EDHREC, shes the second most popular Izzet commanders on the page. This is for good reason, as this near immortal is no pushover! The suspend mechanic is pretty fun to play and is very hard to work around for opponents. Tapping for 2 generic mana, you are able to put the cards in your hand into the blind eternities for 4 turns. Floating in between planes they are difficult to touch until the countdown ends and they’re ready to be slammed onto the table in a thunderous fury! 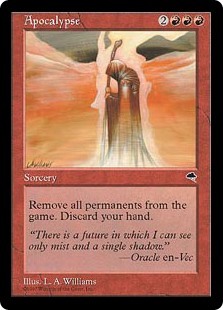 What is great about suspend is that those at the table cannot interact with the cards why they are suspended. They cannot even remove the suspension by killing our empress, as once she uses her ability, it’s too late! Although you cannot interact with the cards while they are suspended, after the time counters are off, they are considered cast. At this point someone can counter them. If multiple suspensions are going off at the same time, the caster can decide how they want to stack them. 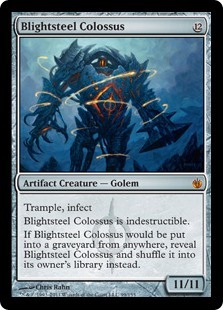 So if you want Oblivion to happen first and then Blightsteel Colossus to arise from the ashes, you can! This is the typical way that a Jhoira of the Ghitu player wins and what experienced players are going to expect. You can use Jhoira’s ability at instant speed. This is probably one of the better advice’s one can give when playing this deck. Do NOT suspend cards on your turn! That just gives people more time to prepare for your onslaught. If you suspend at the end of an opponents turn, then now at your turn that’s about to happen, your cards have 3 suspend counters instead of 4! The Eldrazi! What’s more frightening then one of the titans staring you down with its nasty Annihilator mechanics? When it’s staring you down with rocket boots strapped to it’s tentacles and you don’t have any mountains to hide behind anymore because the landscape just went through a reckoning! 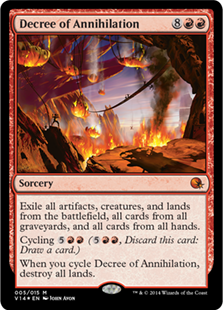 These make a quick end to games because not only do they beat people while they’re down, but they make sure those pesky land drops stay removed from the field after you already took care of everyone’s lands. After all, you’re laying down the law and not leaving any low drop shenanigans come to play. Now some people might think that Jhoira is too kind for such tactics. This is where everyone is dead wrong. Why? Let conspiracy Kya sit you down and tell you one of her multiverse involved theories. Now, story will tell you that Kozilek and Ulamog were somehow magically lit ablaze by Chandra. The Titans of the Blind Eternities taken down by the Power Rangers? That’s flat out silly and insulting to expect us to believe something like that could happen. No, what happened was that while Jhoira was out looking for her lost lover, she found a new interest instead. How she get there? Time wizard, don’t question me. This is just speculation, but it’s my belief that Jhoira suspended her new tentacle friends out of the plane just as Chandra futilely attempted her firey Kamehameha. The timing made everyone believe that 3rd degree burns could murder these walking representations of how a MTG anime can go very, very wrong. 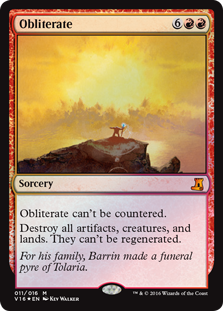 Of course reality hit the walkers finally when they challenged Bolas…but anyho… back to the deck before people start dropping from intense nosebleeds. And on the 8th Day, there was Fire! Despite these not being as impressive as some of the other cards I’ve shown so far, these are the bread and butter of a successful Jhoira deck. Jhoira’s greatest weakness is that she flaunts her threats in front of everyone’s noses for several turns before the suspension is over. 4 turns is a long time for people to prepare for your Apocalypse or try and murder you before it goes off. These cards however will quickly make your suspensions unpredictable and help you manipulate when your cards are coming out. One golden rule that I’ve noticed when playing others with this deck, is that they’ll tap out preparing their field to kill you before the last time counter. It’s then that I remove the 1-2 counters left and cast my cards. They then cannot counter these terrors and accept their fate. These cards are super cheap and there is no excuse to not get them! Of course, you’re not much of a time lord if you don’t have cards that manipulate time. 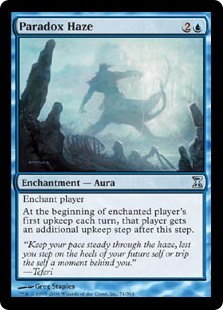 Paradox Haze is another must have for any Jhoira deck. 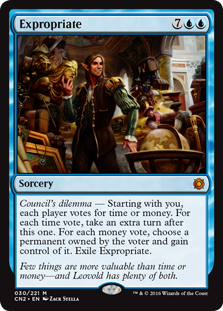 It takes half the time to cast your suspended cards as you get two upkeeps a turn! What’s more is various Time Warp cards will give you more time to get your cards out. Of course, being a time lord means your obligated to make this needlessly complex. 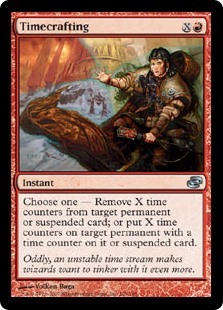 So why not suspend the mana heavy Time Stretch so you can later get out your other suspended cards quicker? Now what people were really waiting for. Bringing Magic to Life! 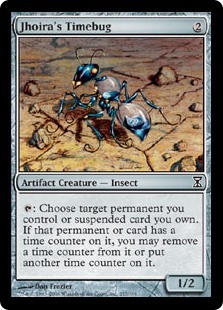 This deck was actually one of the main reasons I started printing out 3d miniatures for my EDH games. I didn’t like using dice for my time counters. I wanted to make something special to represent the time counters so it could be easier tracked. Of course, the biggest obstetrical we have with an hourglass is that it’s round. It’s a cool concept, but it still needs to easily let me and others know how many “counters” are left on it like a dice could. If I leave it on its side, it’ll just roll to another number. So that’s where you have to be a little creative. Adding in 4 handles around the hourglass allows you to keep whichever side you want to stay still. Below here is the particular design I decided to use. I wanted to make it a little evil looking as the deck represents the absolute evil I can be when playing EDH. Adding reaper like scythes at the end provides both function and style. Keep in mind we’re printing these fairly small, so keep the detail to a minimum! There was not much of a guide needed for this, as it was made very basically. 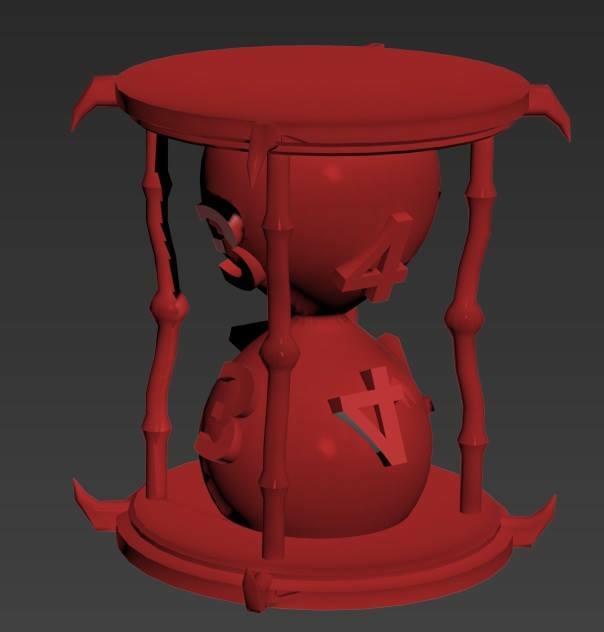 The hourglass itself was made by manipulating a sphere and a cylinder. Then you just add symmetry on the y axis because it’s identical. After which you manipulate a sphere a handle and copy and paste it around the hourglass. Finally if your program has it, you can auto generate 3d numbers and add it to your model as I have. I have it on both sides of the hourglass to provide easy reading to both me and the people across from me (or if I stand it up). Easy right? Don’t worry about making it too simple! Like peeling a sculpting a statue out of marble, it’s all piece by piece. 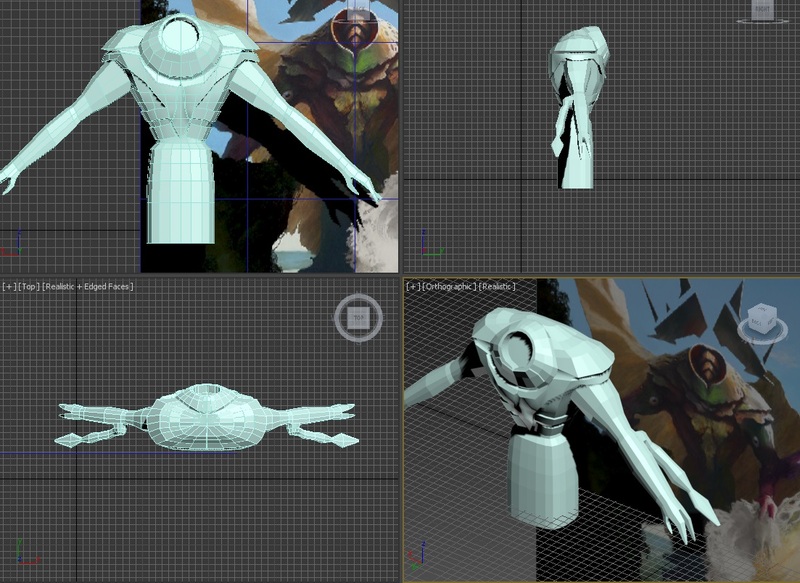 Now the sides was a little difficult to reference, so I went with a basic male torso as the torso is fairly humanoid. Now it’s time to add a few layers of detail. Remember, you’re printing small! Don’t go overboard in detail. Now he’s starting to look like his Eldrazi self! 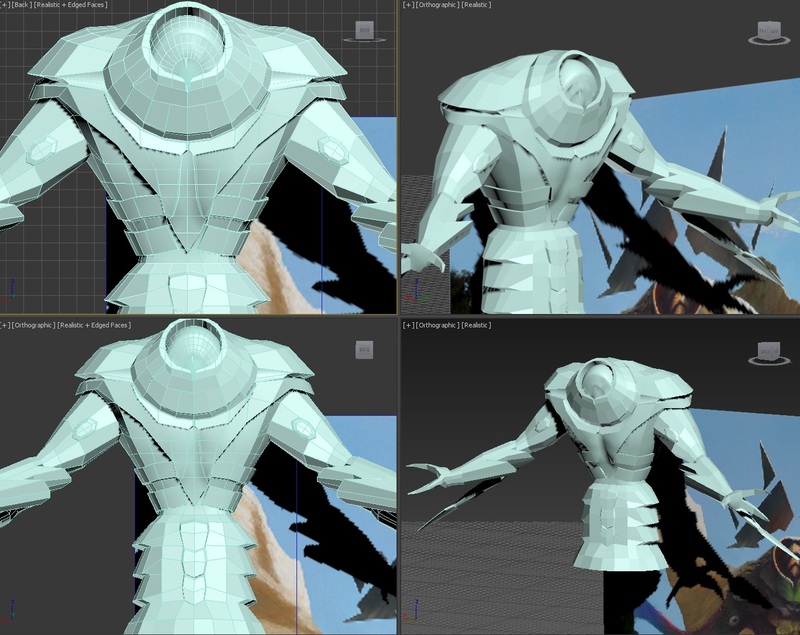 Giving him small Sayian-like armor by extruding, his extra layers can be made quickly. I’m not going crazy with it though, as his armor in many aspects is wave like…but it’ll be difficult to print and stay stable. Now we’re going to extrude little nubs for the arms and head to give us a better reference point on where to expand on, piece by piece. We’re getting closer! 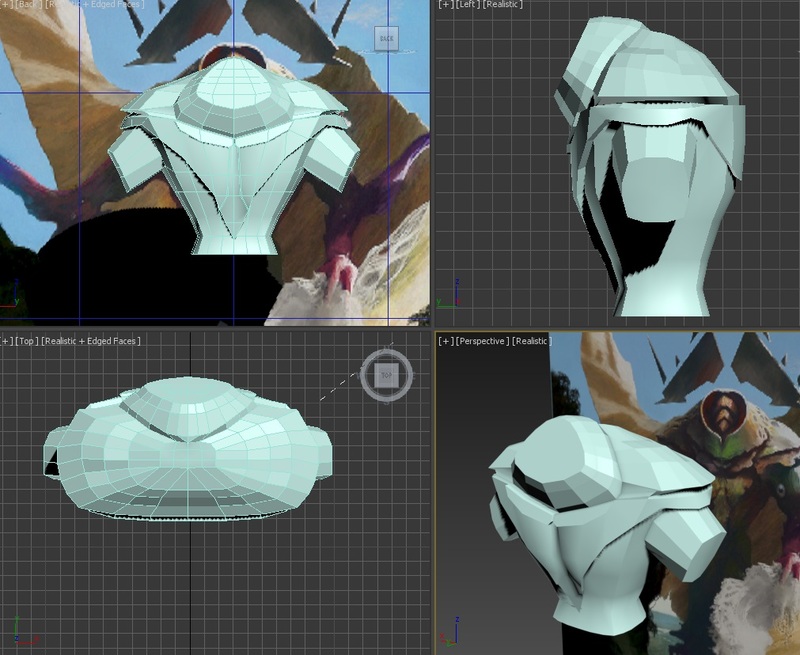 As we expand the torso and some texture to the “armor”, we can finalize the curves over each corner. 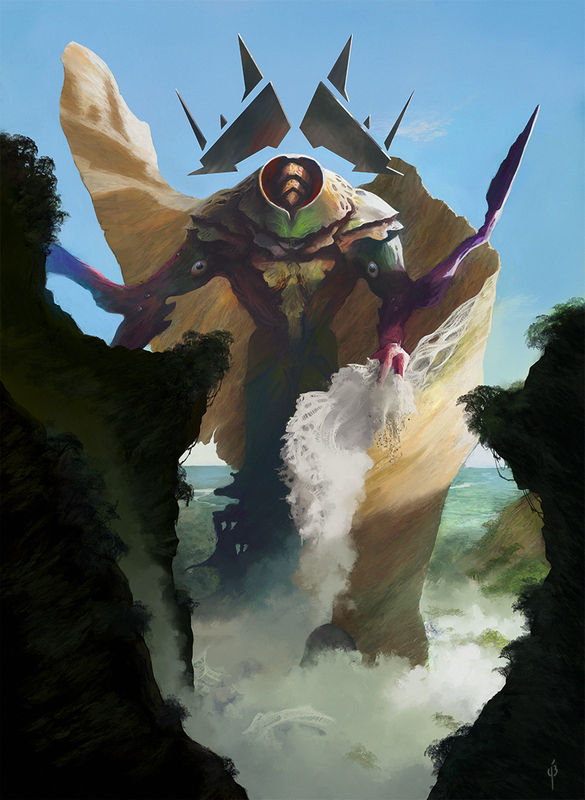 Expanding on the arms, don’t forget the “spike limbs” that expand out of the Eldrazi Titan’s elbows. 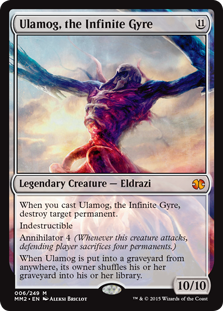 Ulamog has very clear art of this, but Kozilek less so. Instead of a second set of hands though, he has spears that actually look pretty cool. Then we can make the crater for the head through a number of different methods. Now for the last part, we just need to make Kozilek’s head. I took half a sphere and edited it to do the eye within an eye thing he has going on. Then I edited the pose to make him look like he’s staring down at someone. The tentacle legs was replaced with a bit of a base, so if I wanted to later I could print him much bigger and have him coming out of a canyon or tentacle landscape. Since I don’t know if he’ll stand straight I made the bottom a bit wider then I would like. Also the spikes on his arms are meh, but after print after print has taught me, small spikes break off easily -.-… spikey arms are better. And Voila! 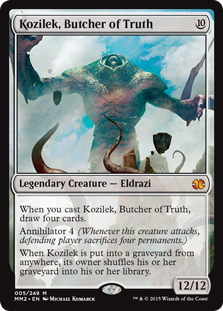 Kozilek is ready to print! After a bit of paint, he’s all set! I set in a simple layer of brown for him, but if you want to get more detail you can add small layers of a metallic color and splotches of dark green (for moss in some arts) to add more detail. Got to wait for this to finish drying and will add more myself! That’s a wrap of today’s deck and 3d modeling. I hope people enjoy the Kozilek as much as I enjoyed making him. I’ll probably make a much larger version to match my Bolas statue some day. At the very least, it should make up for my evil decklist that I’m spreading across the net. 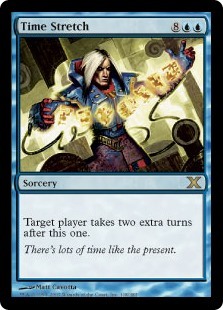 In case it didn’t, below is one more gift for those playing the newer set. I had a ton of fun at the pre-release (always great cracking Planeswalkers) and was able to use these treasure tokens to summon big giant dinosaurs! 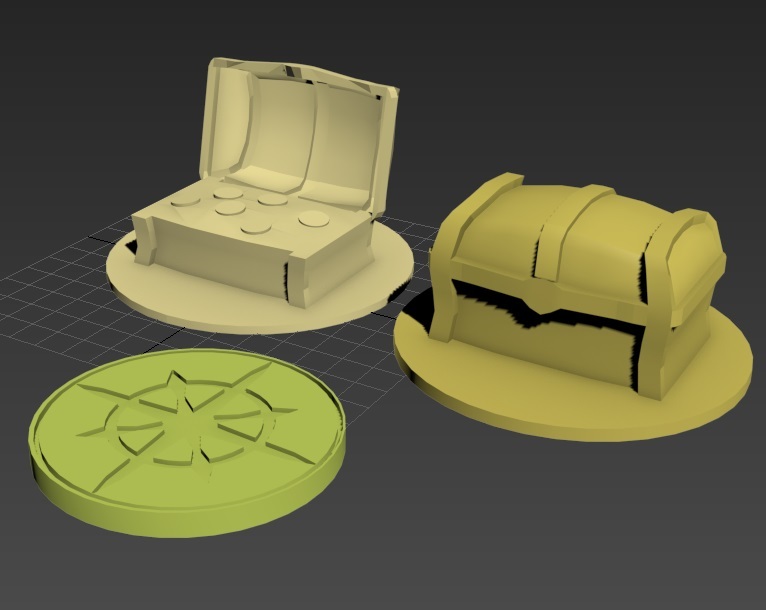 Below is a link to download your own Treasure Tokens to print! Normally I end my mini series after 2 articles, but if you’d like me to continue making 3d models and MTG items, leave a comment below! If you would like to see more, let me know what sort of deck and MTG themed creations you’d like to see me make next! 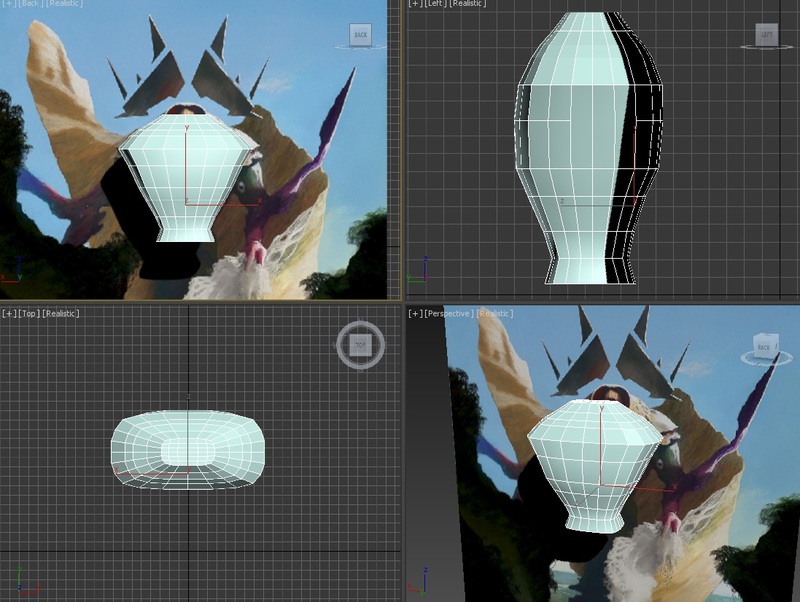 These 3d models do take up a considerable amount of time and 3d print material, so if you’d like to support these workings to keep the models free for everyone, please stop on by my site and help out! Anything there helps me spend even more time providing free access for everyone to print out their own miniatures and customize my workings for their own projects.